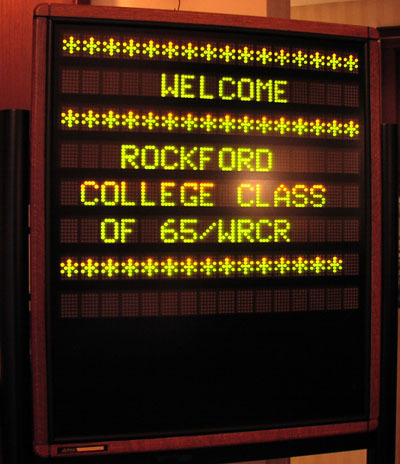 Over 25 WRCR Alumni turned out for at least some part of the 2005 Reunion Weekend at Rockford College. Here are some photos from Friday and Saturday. Click on the thumbnail for a larger image. Close the large image window to return to this page. 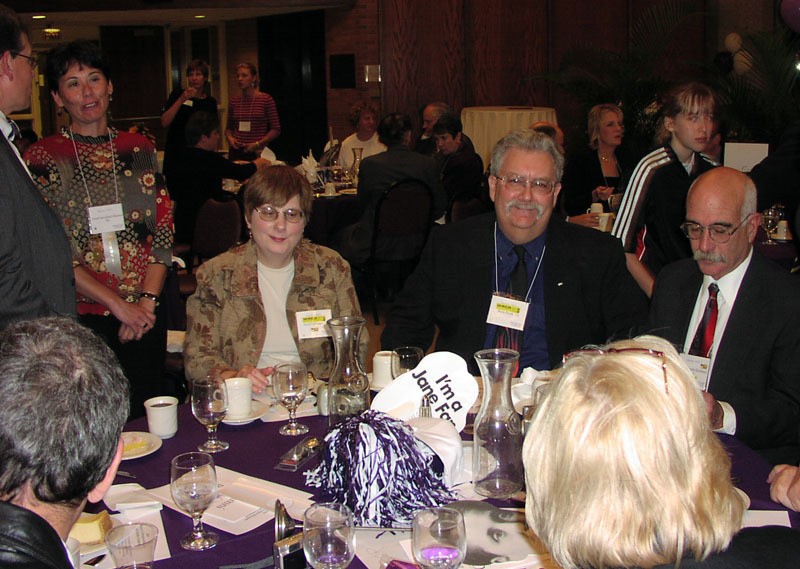 Some of the WRCR folks were seated with President Pribbenow for Friday night's dinner. Outside there was a beautiful sunset, inside old friends visit. L-R: Kathy Hackwith Groth, Cece Forrester (back to camera), Mark Groth, and Ross Hunter. WRCR alums were asked to stand and be recognized. L-R: Cece Forrester, Mark Groth, Kathy Hackwith Groth, and Brian Dubin. Over Brian's shoulder you can see Irene Bace, John Bace and Tim Coleman. Back in a familiar space. Kathy and Mark Groth visit the Maddox Theatre stage. This picture came in titled "The Last Breakfast". L-R: Cece Forrester, Kathy Hackwith Groth, Mark Groth, Ross Hunter, Carol Hempel Hunter, Brian Dubin and Rose Dubin. Landis Buchman is front and center. 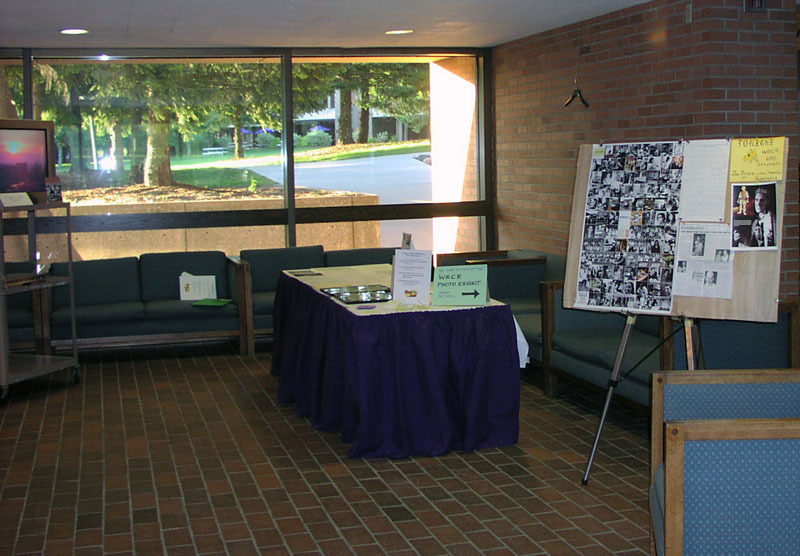 The WRCR Reunion display and gathering spot in Burpee Center. Cece Forrester (left) wonders what she has gotten herself into as (l-r) Charlie Branham, Tom Hill and Pinky Miller psyche up for the first contest round of Saturday night at the WRCR reunion. l-r: Cindy Bugajski Sundstedt '78, Susie Fuchs '78and Bern Sundstedt '77. 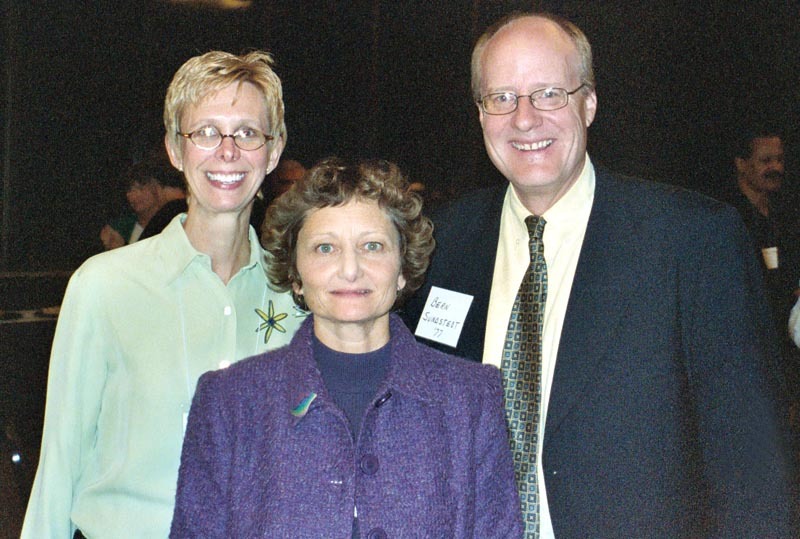 Susie received the 2005 Award of Distinction. Both Susie and Cindy were on the WRCR staff. Some of the WRCR group listening to Dean Kenrick Peters talk about WTPB. 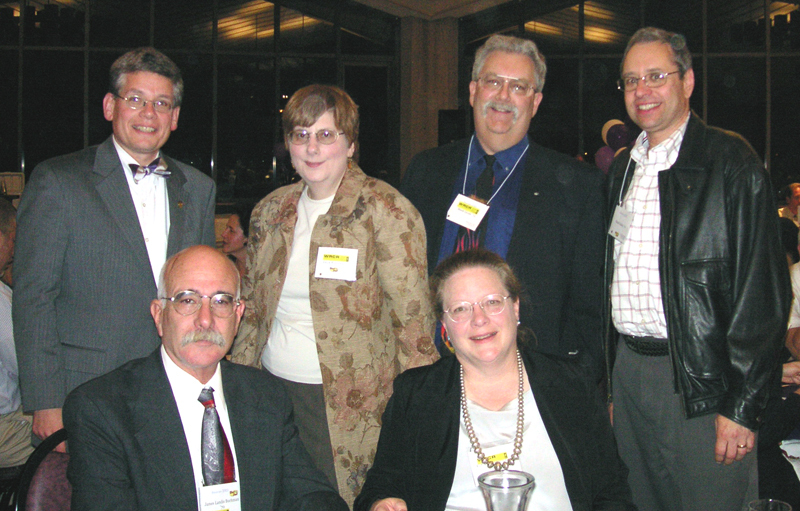 L-R: Pat Brauer Whittenberger, Ross Hunter, Lucy Geyer Clark, Marv Cutler, Eric Hansen, Jennye Hansen. Cece Forrester at the podium conducting the first contest of Saturday night. 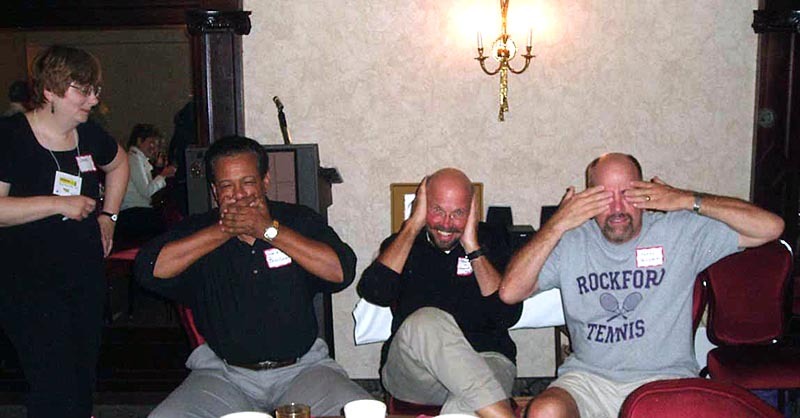 The contestants (l-r): Charlie Branham, Tom Hill, Lewis "Pinky" Miller. Some of the WRCR Alums dined with RC President Paul Pribbenow Friday night. 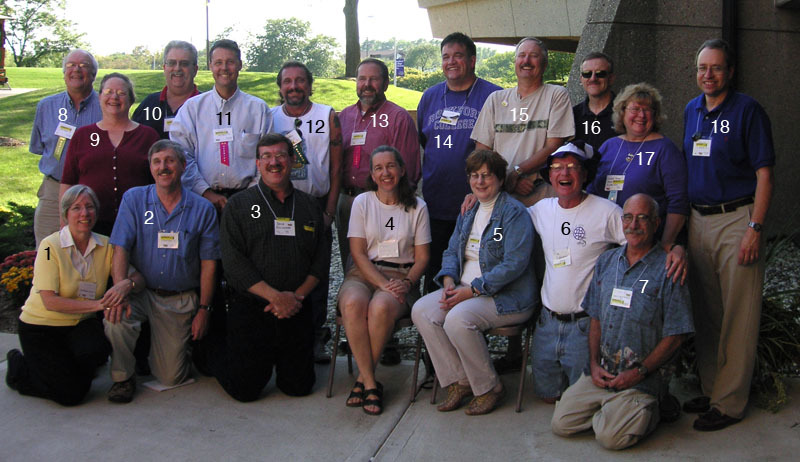 L-R front: Landis Buchman, Kathy Groth; back, Paul Pribbenow, Cece Forrester, Mark Groth, Brian Dubin. 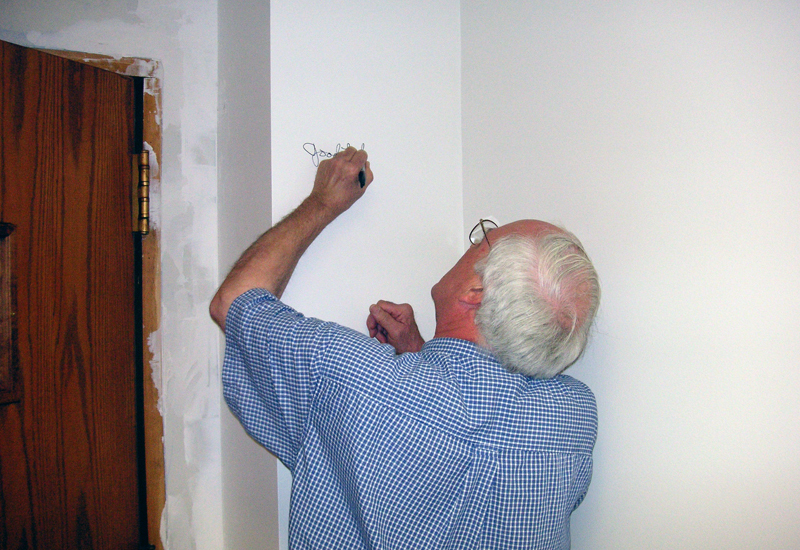 Eric Hansen, a founder of WRCR, was given the honor of being the first to sign the studio wall of WTPB. The talked about WROK door is at the left. 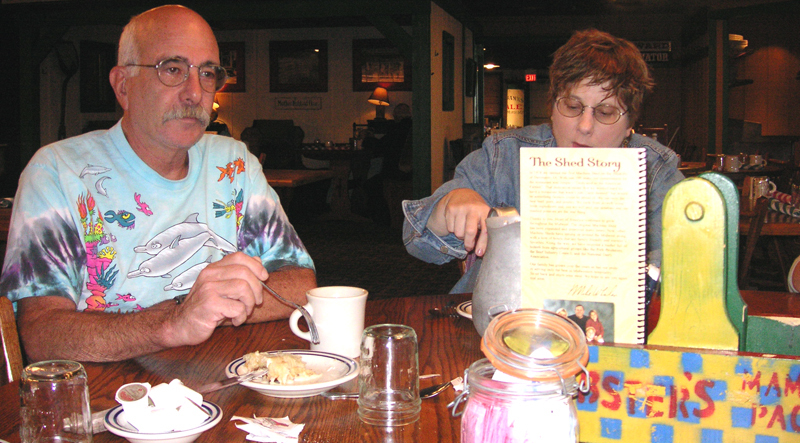 Sunday morning of Reunion Weekend and a group met at The Machine Shed restaurant for breakfast. Landis Buchman (l) described it as "the land of giant food". Cece Forrester is at the right. 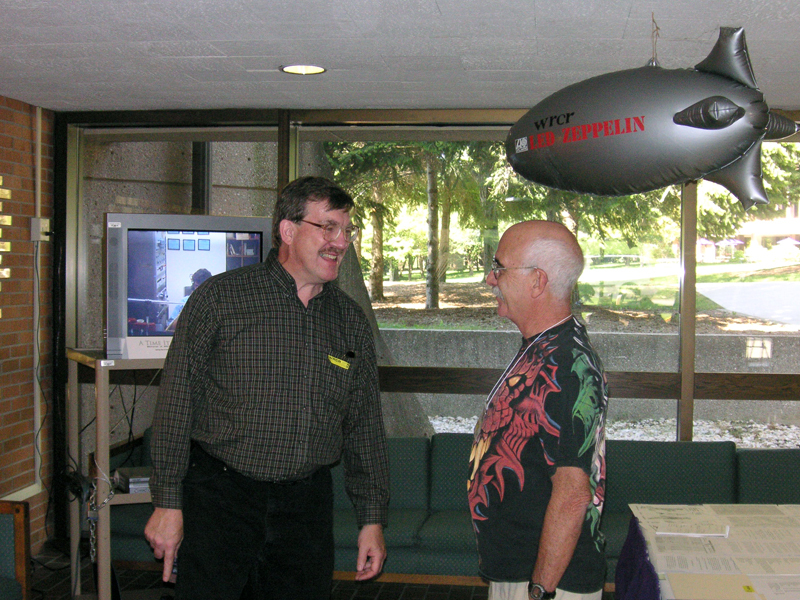 Dave Billingham (l) and Landis Buchman at the WRCR display area. Note the tv picture over Dave's shoulder. That's Landis in 1969! Elijah Lewis, Brian Dubin and Ross Hunter, all from the Class of 1971 and all WRCR Alums. 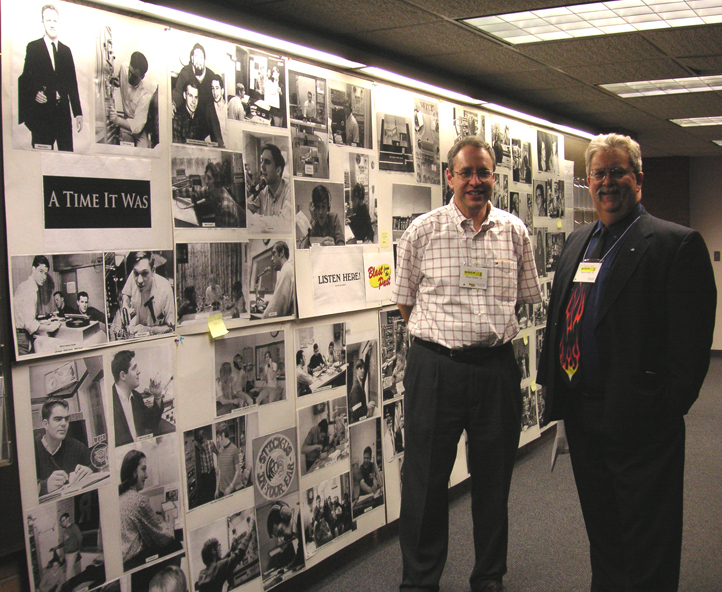 Brian Dubin (l) and Mark Groth at the wall-o-photos that Brian and wife Rose put together for the reunion. 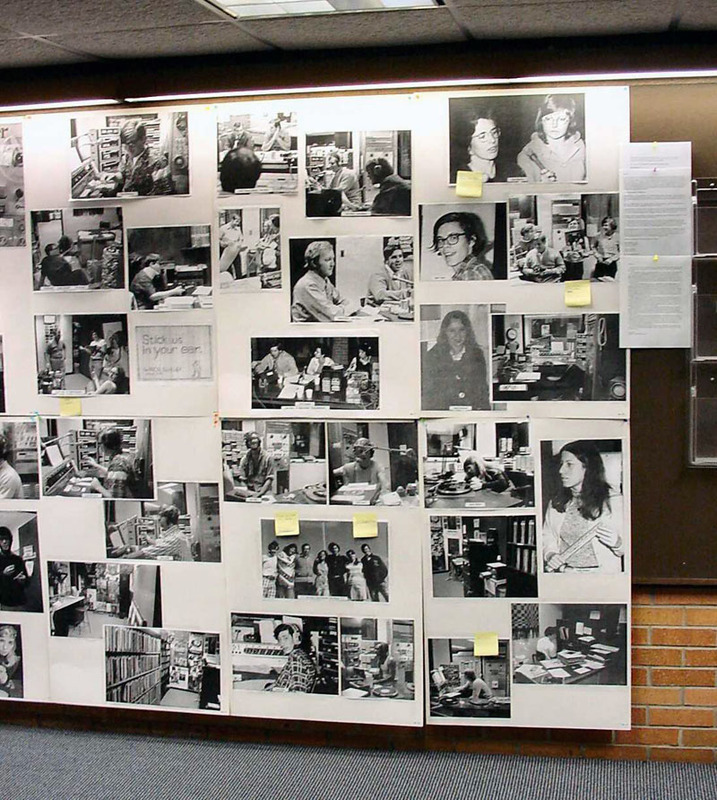 The photos covered 108 square feet on this wall and another. 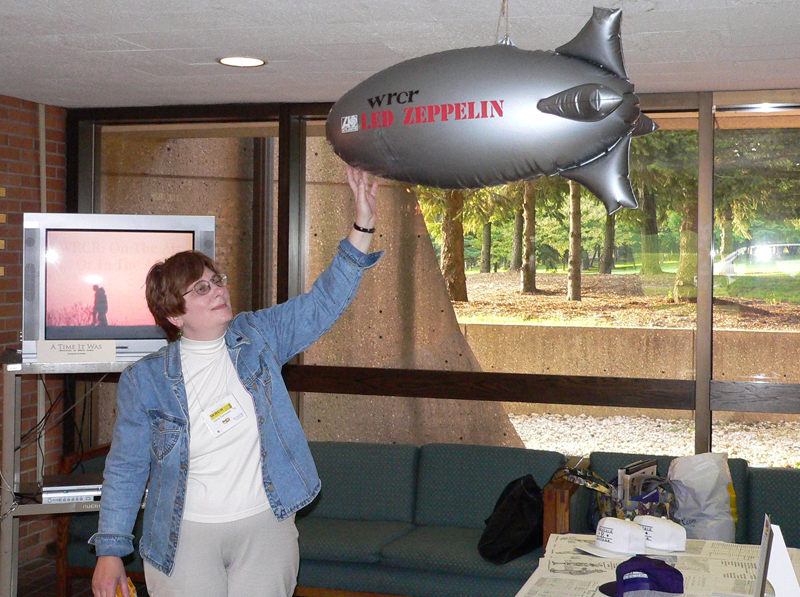 Cece Forrester and the WRCR Led Zeppelin that Dave Billingham brought for display. 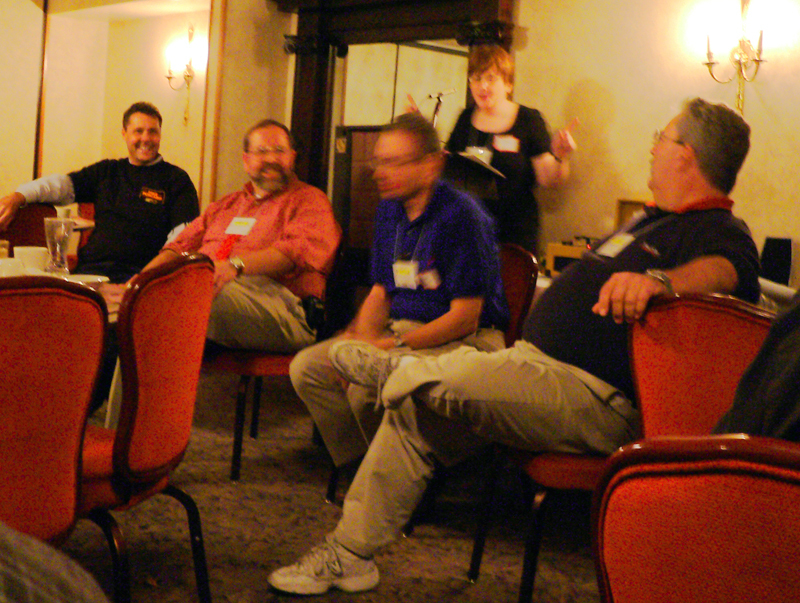 After dinner Saturday night, Cece led the group in a couple of contests. This is a picture from the DJ contest where the contestant had to name the title and artist of a song. Then for extra points they could try to talk over the intro. In spite of being out of practice for 30+ years all four did well. 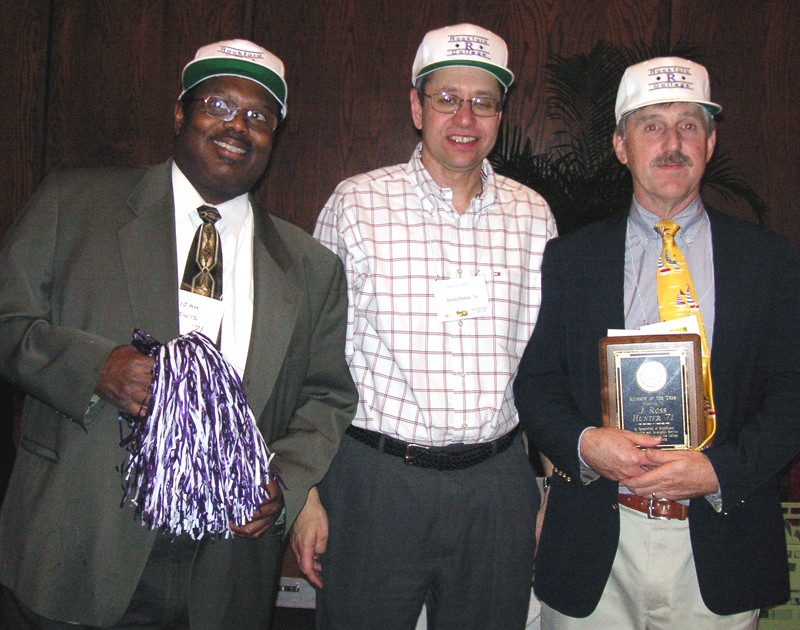 L-R: Jerry Mayer, John Bace, Brian Dubin and Mark Groth. 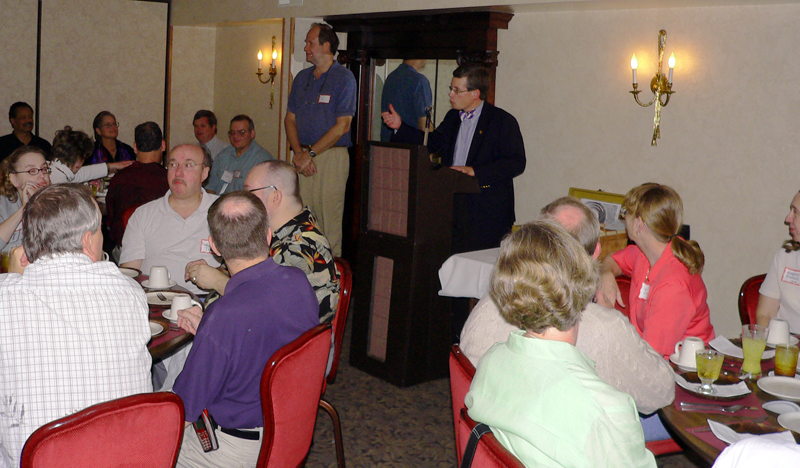 RC President Paul addressed the Class of 1965/WRCR group during dinner at Lino's Restaurant. 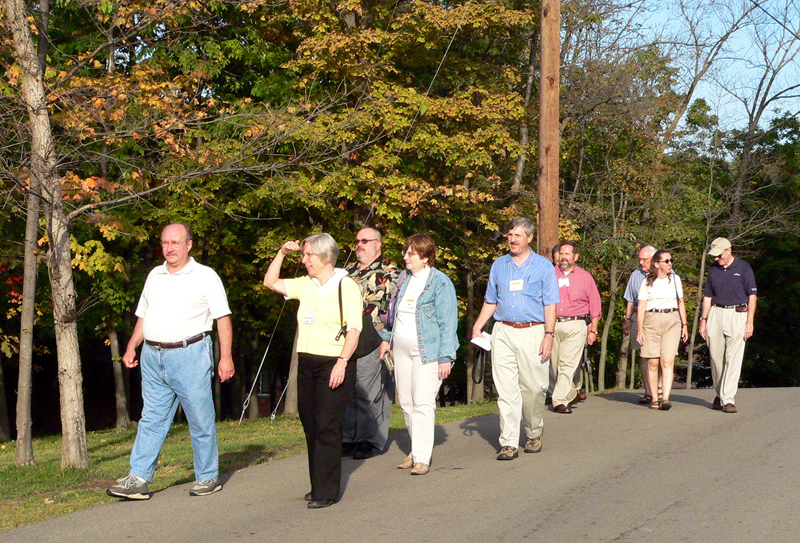 Another picture of the group touring former WRCR sites. This picture was taken behind Scarborough Hall between the Cummings Complex and the last location of WRCR, Lang. 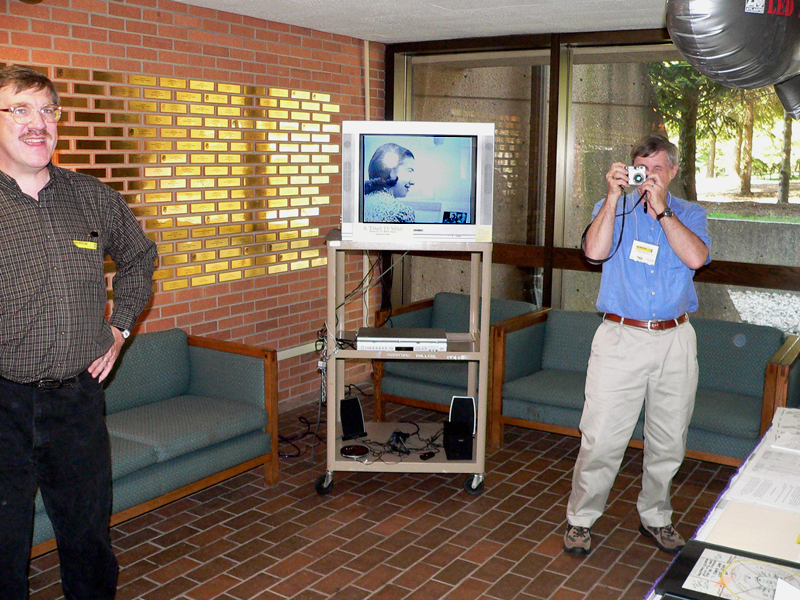 Ross Hunter is taking a picture of Mark Groth taking a picture of Ross and Dave Billingham at the WRCR display area in Burpee. 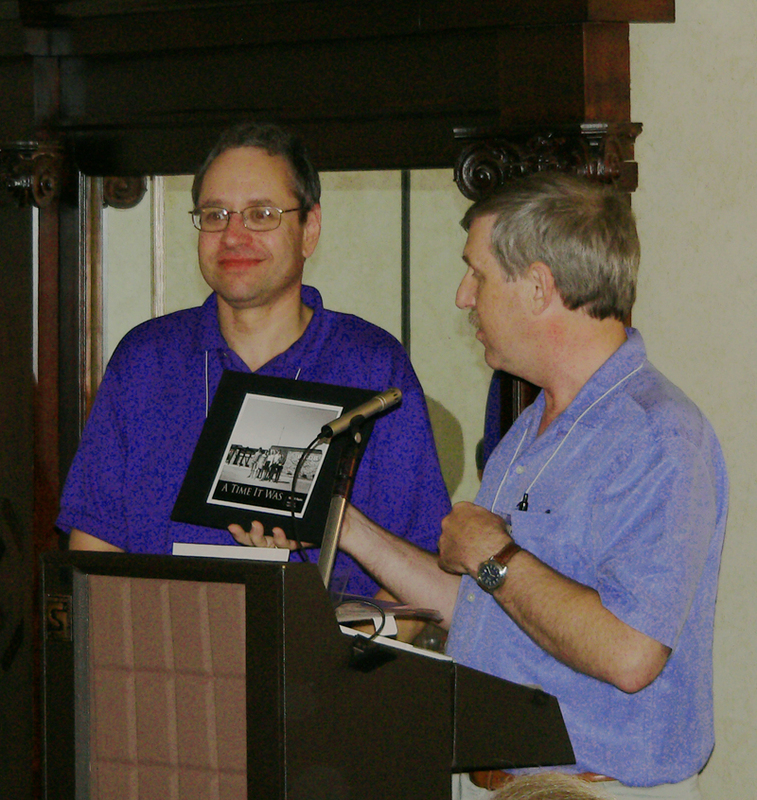 Ross Hunter presents Brian Dubin a book of WRCR pictures from 1968-1970 in appreciation of Brian's assistance with the Yahoo Group and Reunion preparations. 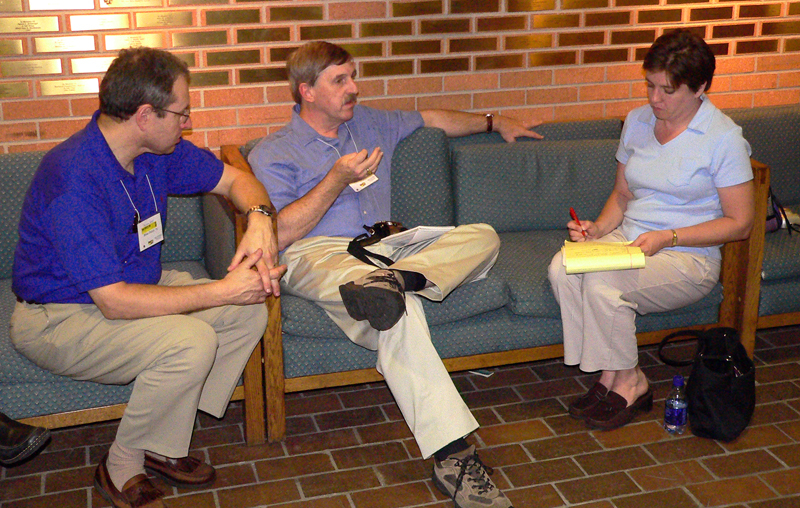 Ross Hunter and Brian Dubin are talking with Colleen Burke of the DECUS staff about the WRCR Yahoo group and reunion. 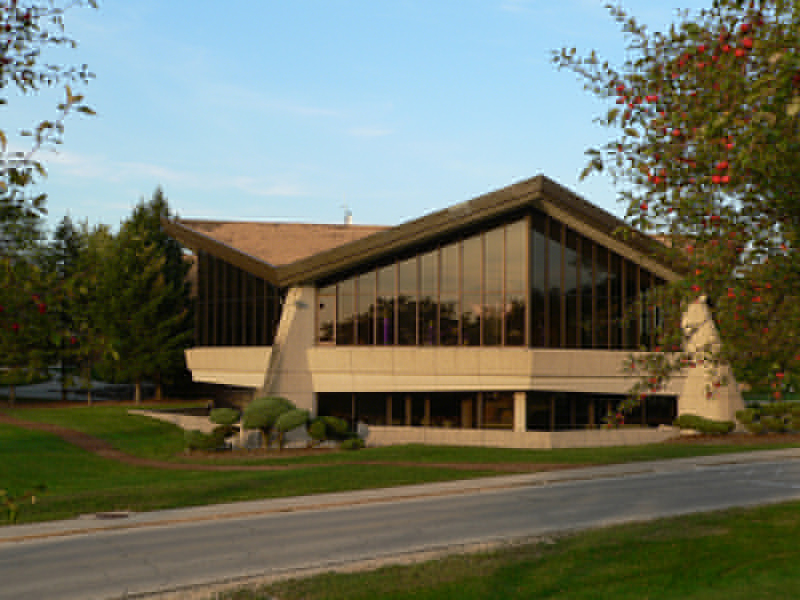 Burpee Center was the home of WRCR from the fall of 1964 through January of 1985. Here's a nice picture of the Burpee addition which housed WRCR from the fall of 1970 through January of 1985. Mark Groth took the picture. The first stop on the walking tour was the space to be occupied by WTPB. There's not much in the room right now. L-R Rick Dejohn, Carol Hunter, Rich Hoge and Mike Herbert listen to Dean Kenrick Peters explain how the room will be set up. One nice touch, the outside door came from WROK Radio. Here's some of the group in t-shirts sent by Mike Porcaro '69. Mike's in Alaska and couldn't make the reunion. IDs at right. 20. Karen Dimond '76 And here are some of the folks preserving the t-shirt picture for posterity. The group photo was taken by Rose Dubin. 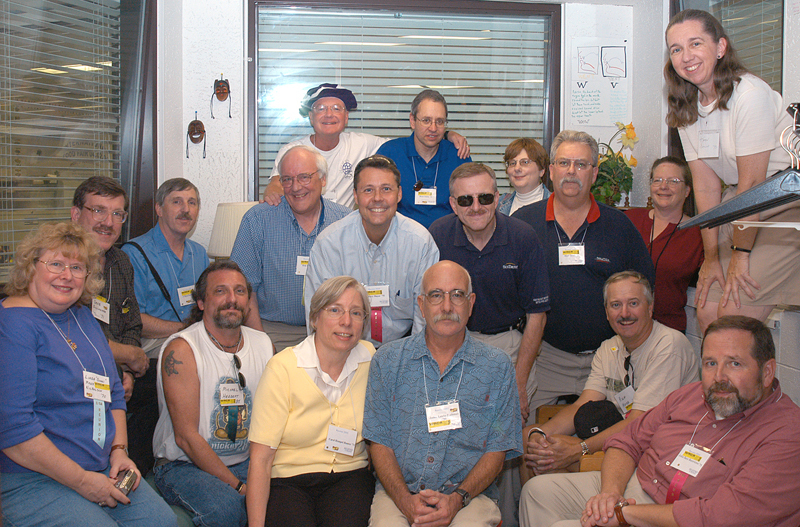 Here's WRCR group at 4 Saturday afternoon. 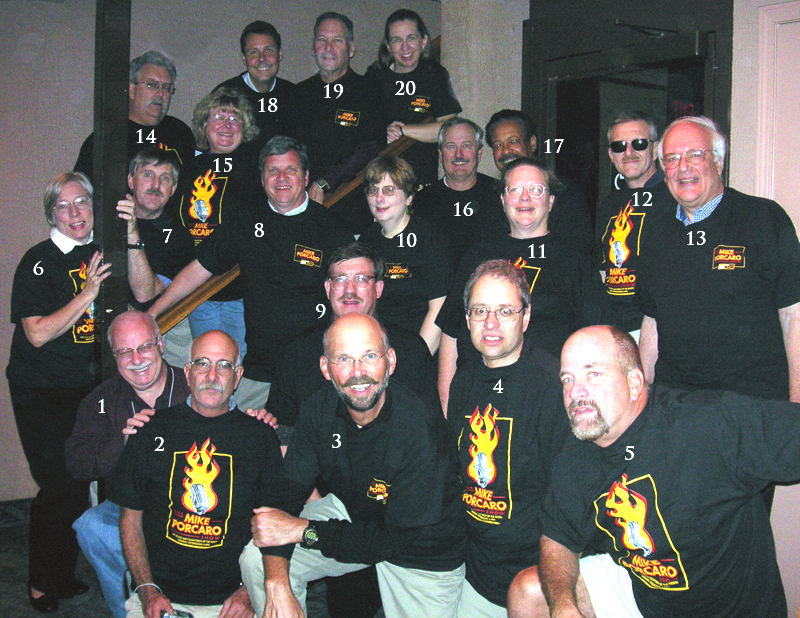 1 Carol Hempel Hunter, 2 Ross Hunter, 3 Dave Billingham, 4 Karen Dimond, 5 Cece Forrester, 6 Tim Coleman, 7 Landis Buchman, 9 Eric Hansen, 10 Kathy Hackwith Groth, 11 Mark Groth, 12 Jerry Mayer, 13 Mike Herbert, 14 John Bace, 15 Michael Morris, 16 Rich Hoge, 17 Rick Dejohn, 18 Linda "Bunni" Mark Nicholson, 19 Brian Dubin Just how many former staffers can you cram in the WRCR 3.0 control room? It looks like at least 17. See that cinnamon bun at the bottom of the picture? It fed 8 of us at the Machine Shed Sunday morning. Landis Buchman says it's the "land of giant food. 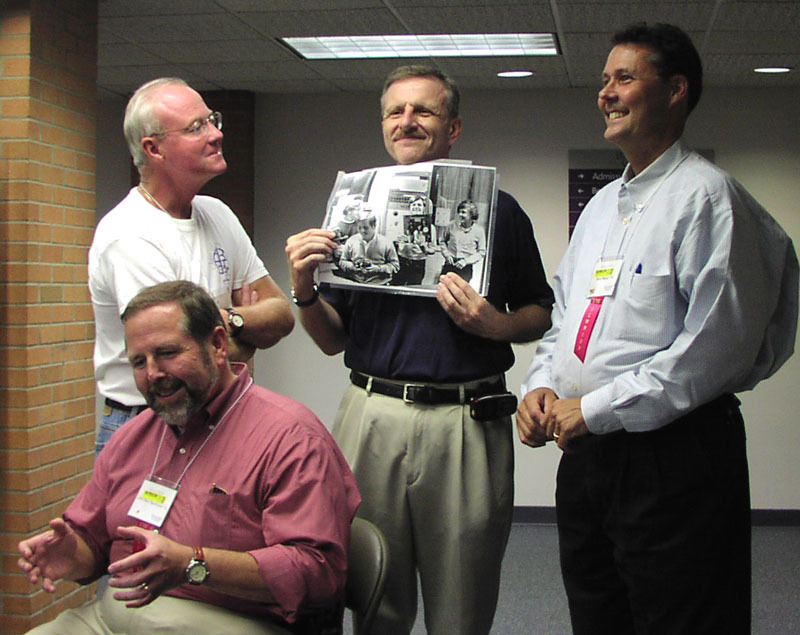 John Bace (front) Tim Coleman, Rick DeJohn and Jerry Meyer recreate a 1972 photo. Rick holds the original. The only thing missing is WRCR. 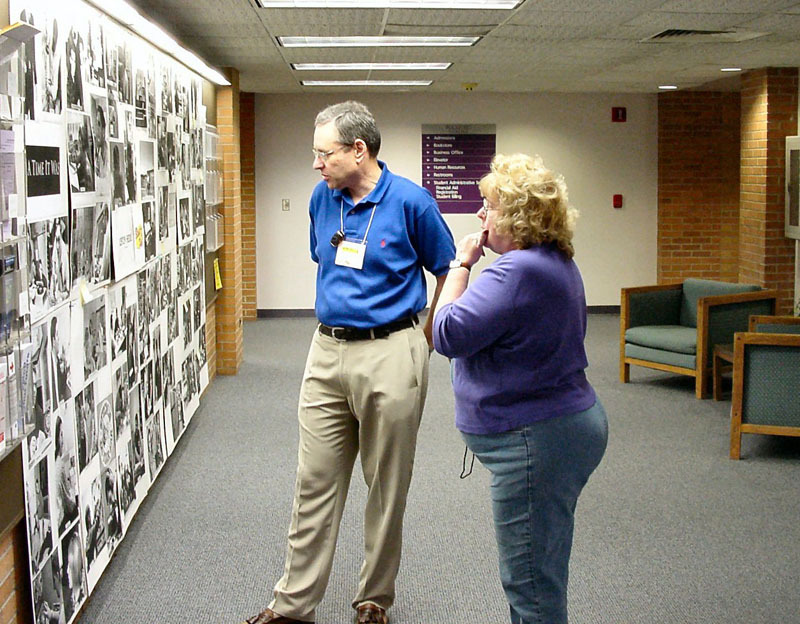 Brian Dubin and Linda Nicholson study the photo display that Brian produced. 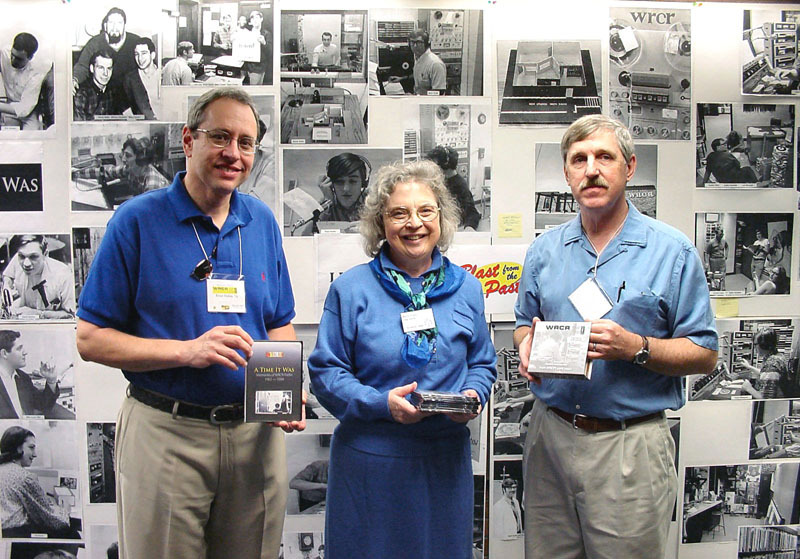 Brian Dubin, left, and Ross Hunter, right, present RC Archivist Mary Pryor with a copy of the WRCR DVD and eight CDs of WRCR audio. 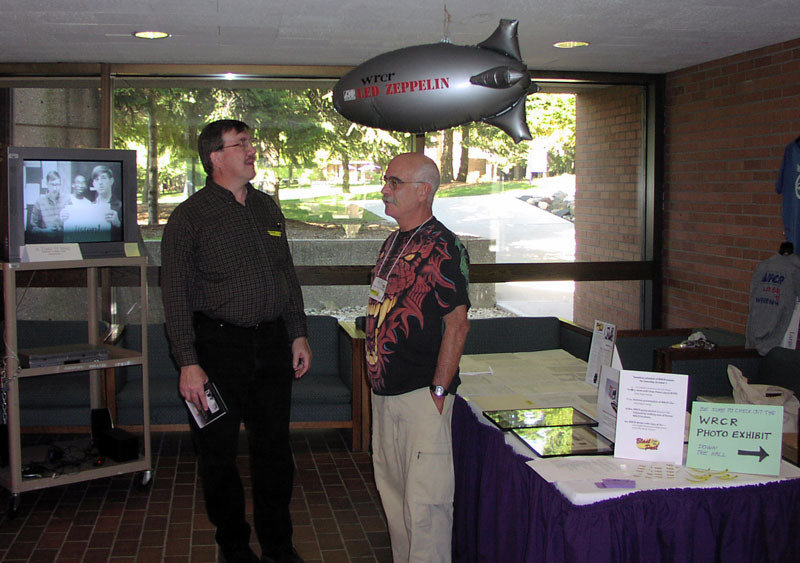 Dave Billingham "Dave Radio" and Landis Buchman with the WRCR Led Zeppelin zeppelin that Dave saved for 35 years. (l-r) Mark Groth, Landis Buchman, Carol Hempel Hunter and Kathy Hackwith Groth at the Friday night awards banquet. In the foreground, Brian Dubin talks with Abigail Pribbenow wife of college President Paul Pribbenow. Jessi Hansen talks with President Pribbenow. 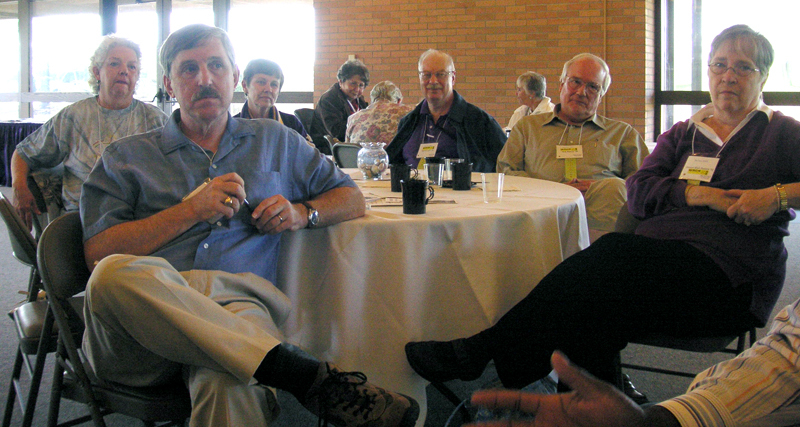 At the table, Cece Forrester, Mark Groth and Landis Buchman reminisce about the good old days. 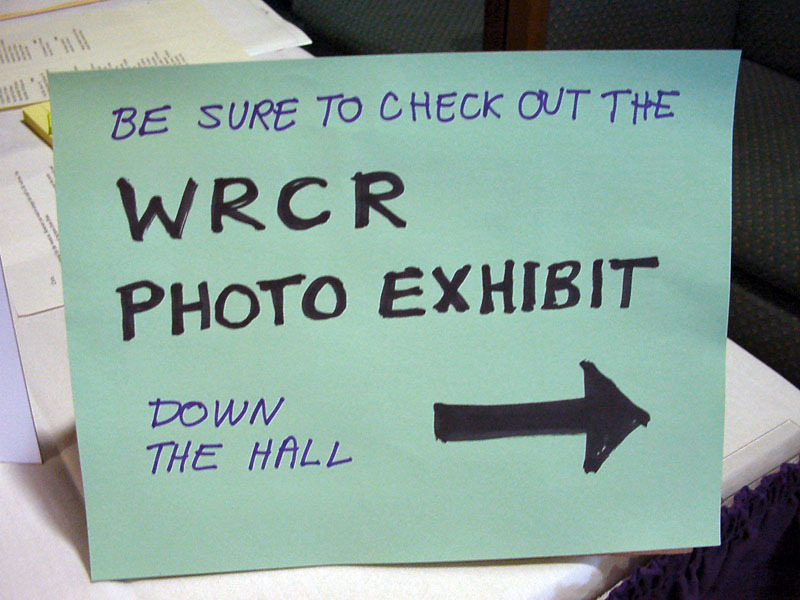 The WRCR display area. At the left is the 22 minute video on WRCR. 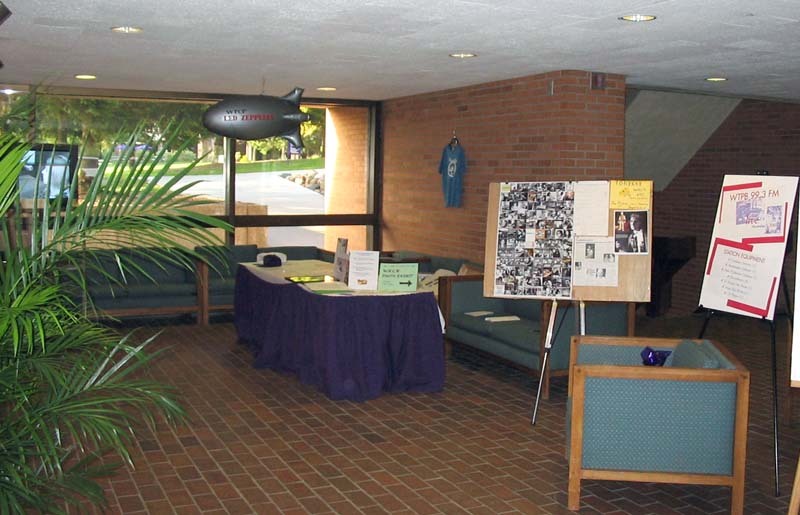 The table has WRCR printed items and the board at the right has a WRCR "poster". Don't miss the photos in the hall. 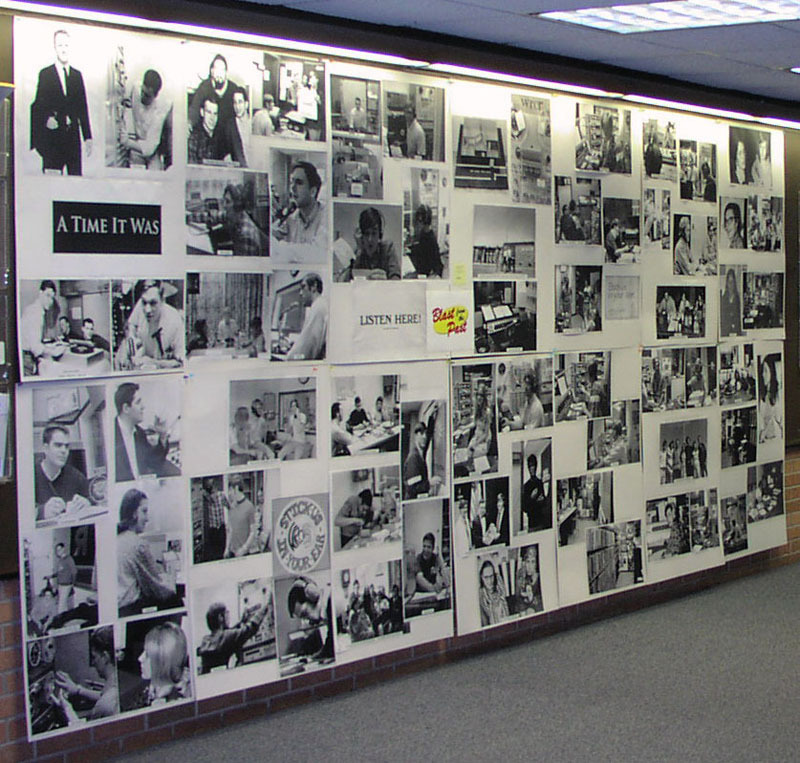 It's 108 square feet of WRCR pictures. Brian Dubin enlarged and printed some of the best WRCR photos. The display was left for the new radio station. Another picture of the photo display. The yellow stickies identify unknown people in the pictures. The person on the left in the top right photo is Billie Jean King. She's being interviewed by Pam Nehring. As the old promo for the Glen Moss show says "From high atop Burpee Center..." This is a picture of the WTPB antenna on top of Burpee. 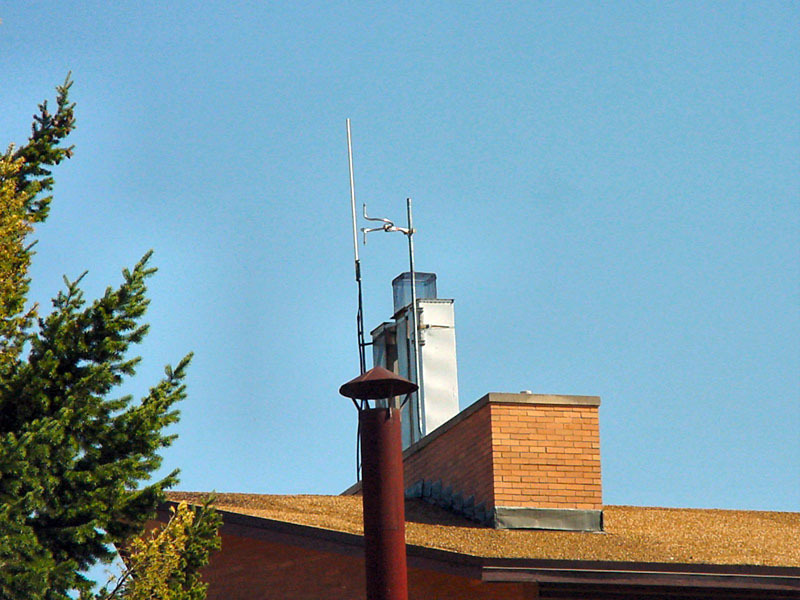 It's the silver rod on the near chimney. 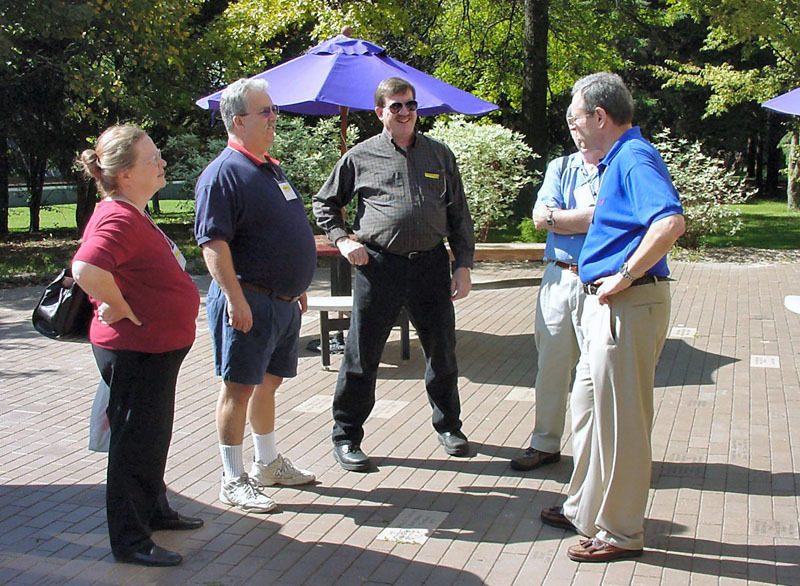 Remembering old times, (l-r) Kathy Hackwith Groth, Mark Groth, Dave Billingham, Ross Hunter (partially hidden) and Brian Dubin in front of Colman Library. 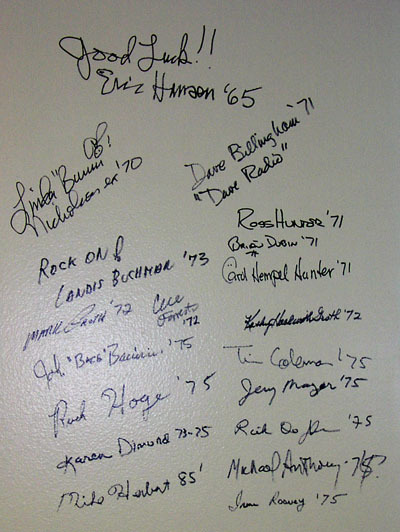 On the tour of the under construction studios for WTPB, former WRCR staffers signed their names to the studio wall. 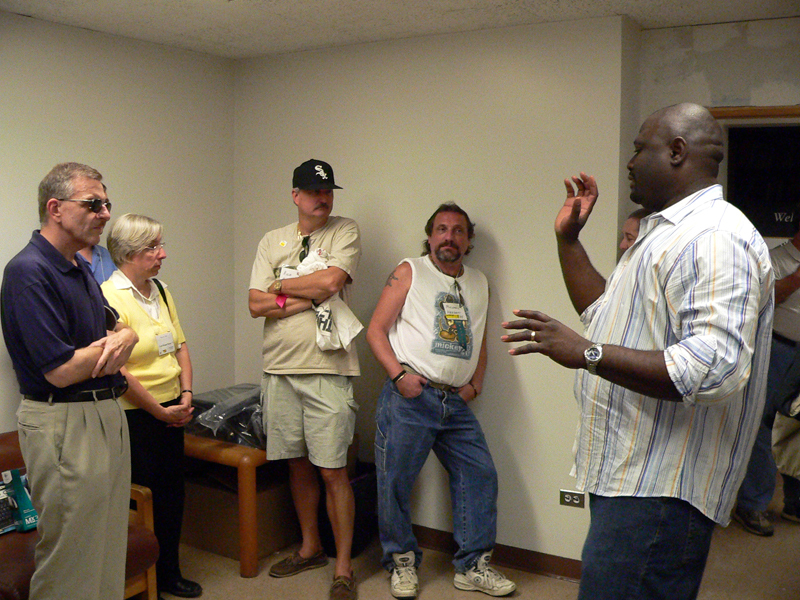 Former WRCR staffers on a tour of the former locations of WRCR. Brian Dubin points the way for stragglers.Some wags referred to the tour as "the stations of the cross." 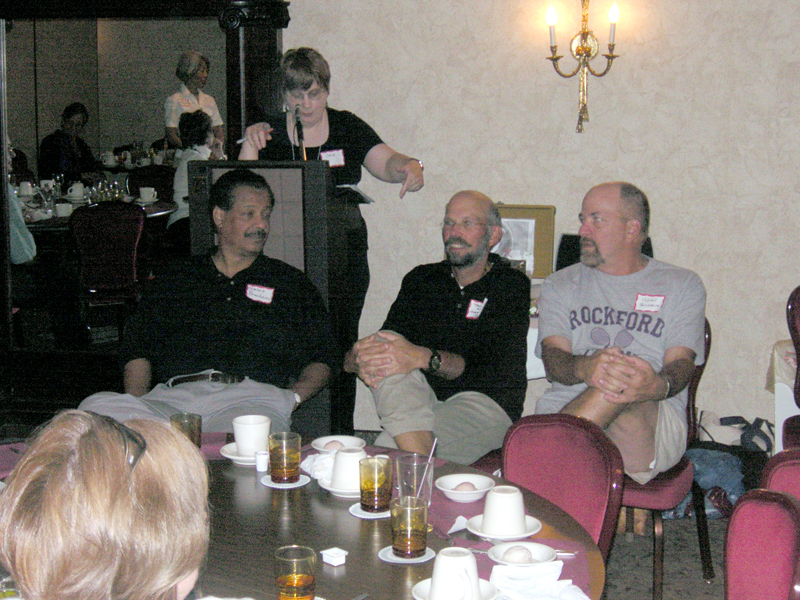 WRCR founder Eric Hansen (second from right) points to the location of WRCR when it was in upper Burpee Center. 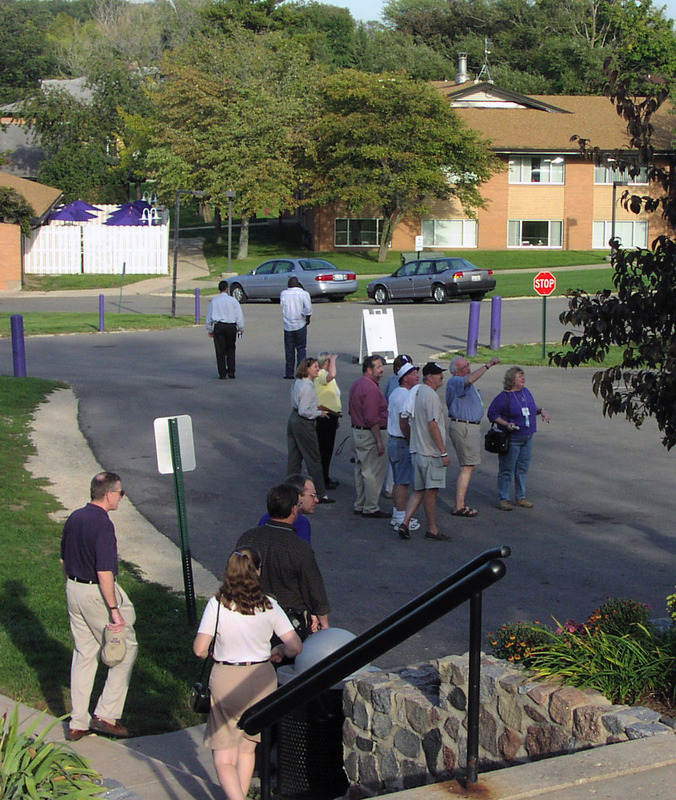 Dean Peters led the tour. 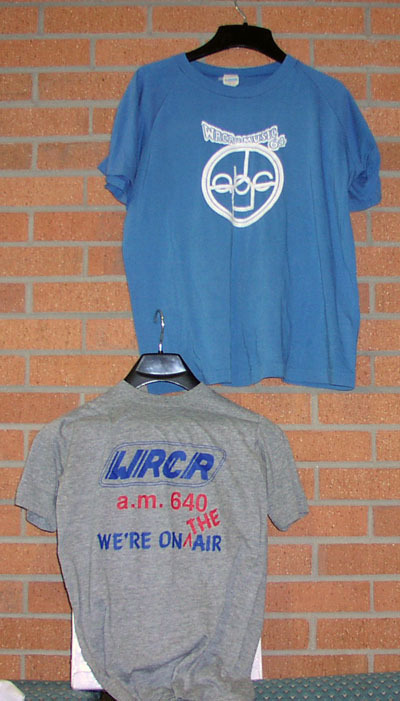 Rich Hoge and Michael Herbert each brought WRCR t-shirts to display. The blue one is from about 1974 and the gray one is from about 1984. 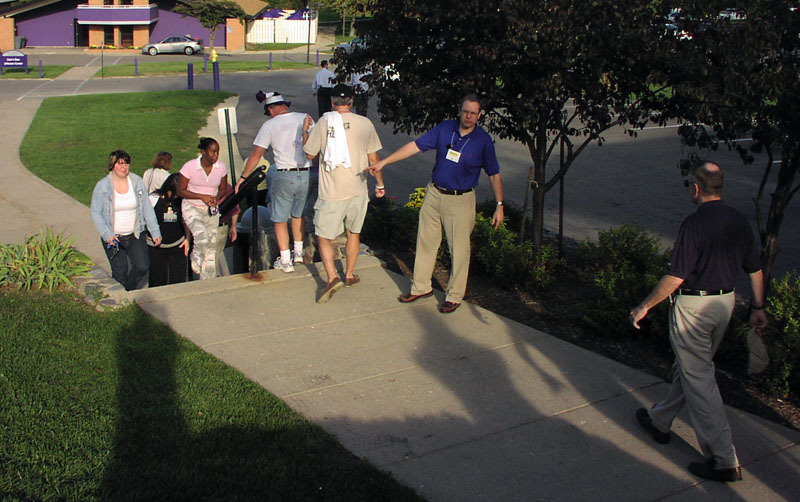 Many of the reunion attendees stayed at the Ramada. The motel had this sign in the lobby. 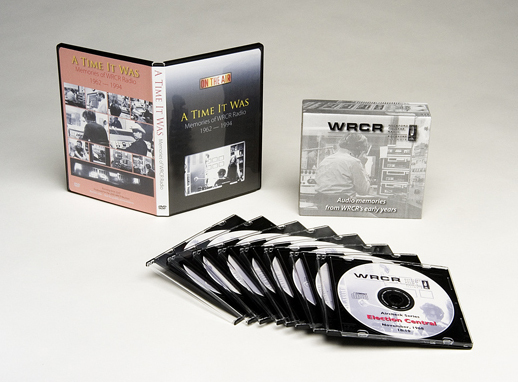 Saturday morning we presented a DVD and eight audio CDs of WRCR audio to the college archives.